Hello friends! I'm in one of those writing moods today where words just bubble forth like some kind of crazy fountain! It's a great mood to be in because now I'm home and no longer traveling so I CAN write on decor8 regularly again and it feels wonderful. I always miss blogging and the practice of writing daily when I'm on the road, writing is total freedom for me. 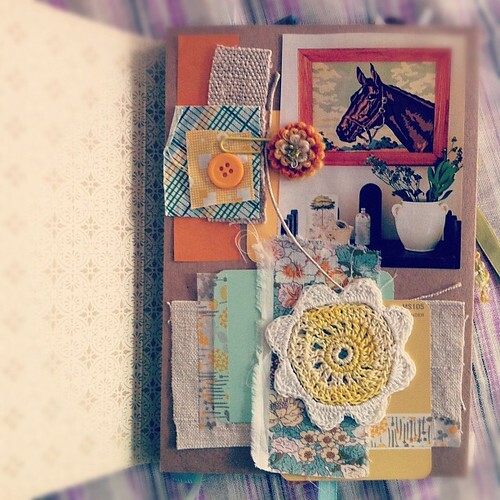 Another freedom, or shall I say creative release (sounds weird but it really is), is when I pull together things visually into handmade books. I've been doing this for ages, since I was a little curious kid, and it started by pulling pages from teen magazines and Highlights magazine then collecting them into photo albums with those giant clear pages... You know the ones that you peel to stick in your pages on that strange adhesive so when you lay stuff on it the paper sorta sticks, then you press the clear page on top. Yeah, those old school albums, woot! 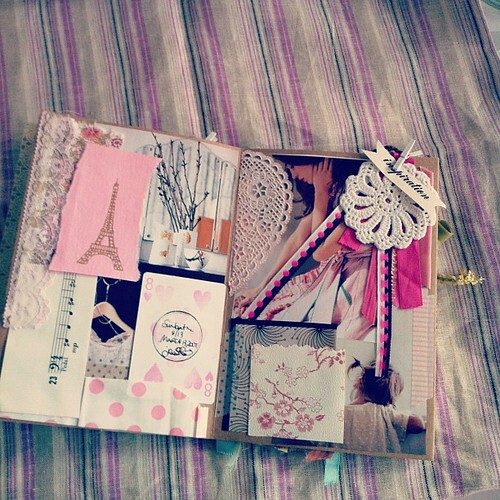 I filled those things with inspirations from magazine pages to stickers, letters from penpals and labels from things that I liked. 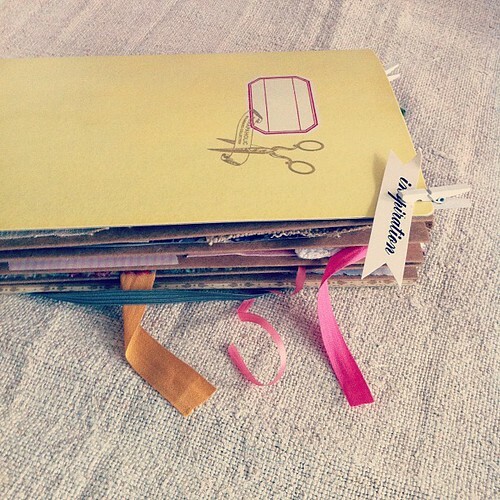 I also used blank journals and diaries or handmade books that I made by stapling together copy paper with a stapler to form a gutter down the middle. I started doing those in the late 1970's when I was maybe 6 years old and I continued making them my entire life - writing in some, sticking things in others - I had sticker books, inspiration books, books I wrote and illustrated with my own stories, and diaries filled with secrets and wishes and how I imagined my "adult" life to be -- which usually involved becoming an author, marrying a cute boy, having a baby and living in another country in a really nice house. Well... Little me ended up wanting the same goals as I grew older and I often wonder at times if that clarity came through the consistent exercise of capturing my imagination and dreams into something more tangible like the books that I made over the years? I believe that the more you either write down or visually share with yourself and/or others, the more you capture your imagination in a sense and freeze it, perhaps it helps put you on your way to gaining a bit more clarity as you make your way through life. Interesting to ponder, right? This spread was inspired by a home we shot in the English countryside recently. I came home and pulled this together using images that felt like the home I had worked in in the same color palette. I almost want to challenge you to test this theory on your own life and to see if, after a year of consistently maintaining private journals and books, whether or not you start to gain a better sense of self. We're constantly evolving so there is never an end point to all of this since we'll be growing as long as we live (or at least lets make that our goal!) but the act of conscious "slow" living vs. hectic "speed" living IS something we really want to do, at least that's what I find most attractive these days as I see the hectic path is ultimately reallyyyyyyy boring and makes time go by much to quickly. I'm wondering now if all of this tapping in and recording our inspirations, goals, heartaches, lessons learned, ideas, etc. is what enhances the experience of living in a way. What do you think? This is a capture of fabrics and ribbons that I collected while in London for a project from various stores like Liberty and VV Rouleaux. I wanted to pull them all together in one place because now I'll always remember them in case I want to work from this palette in the future on another project. I thought to go along with my words that I'd share a few images that I took with my iPhone today of these mood board pages that I made in a book over the past six weeks - they show some of the impressions that I've had on the road while I've been working on my next book. I didn't feel like writing my impressions from each trip in a diary because I have to write so much as it is INSIDE of the actual book and on this blog that the thought of writing a diary during this time made me a bit tense. I still, however, wanted to keep track of my inspirations along the way so I thought to do it in a visual way instead. Plus, it ended up inspiring me through a bit of a creative challenge. This book gave me a chance to record things with a glue stick and a few minutes of my time. I shared this with our Blogging Your Way Road Trip students recently in New York and they seemed to be very inspired by it. I hope you are too. This was pulled together based on the same home in the English countryside that had inspired me so, so much. 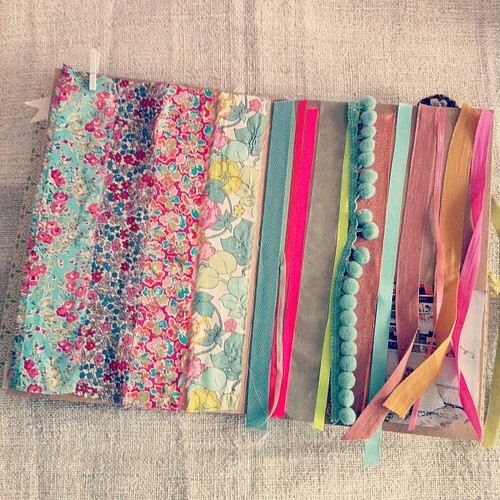 I used found items, washi tape, paint swatches, buttons, clips, etc. to pull together a paper that reflected the mood of that home. Creating visual records can be very inspiring while you're doing them but also to look back on them, for me at least, I inspires me all over again. For instance from this book I am able to recall the exact things that struck a chord with me on certain trips -- seeing them again gave me some new ideas for the future. Remember... 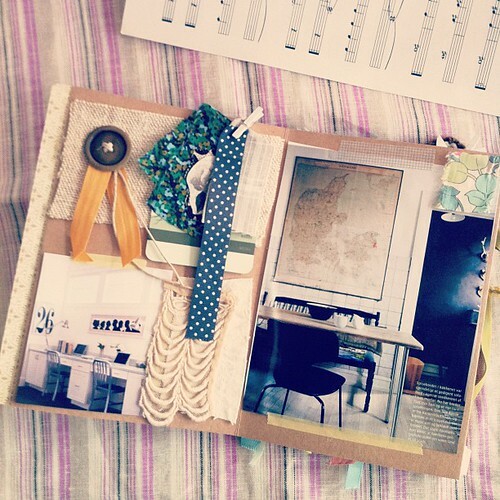 Mood boards don't have to be on actual boards on your wall. As I taught last year in the series of Mood Board Workshops in the US and London for Anthropologie, mood boards can be on a wall, in a book, in a manilla folder, in a mini mood board book (aka portable photo album with clear sleeves) or an inspiration wire which is horizontal and hung across a wall, window or above a sofa or bed - anywhere that you want really - where you can tack on what catches your eye at the moment. Visual recordings like this can be enlightening, especially as you begin to see patterns in your thinking, spot a theme or discover new ideas. This is a spread that I created using tears and bits that I've been collecting in my desk drawer for several months. I noticed everything I had collected there fit together in a strange way so I decided to put them in the book so that I could refer to this later. I love seeing how gray, cream, goldenrod, industrial elements, strong graphics (like numbers, silhouettes and maps), polka dots and a bit of olive green can work with a touch of a floral fabric that is a bit country. Again, it's all about capturing moments and collecting them someplace outside of our own heads (or a desk drawer). What I love about the books that I've been creating at home since I was a kid is that, unlike a board or string or something that's a bit decorative and public in your home that others potentially see, you don't have to edit out anything or hold back in your books. It's also different from a blog or Pinterest because your book can be private and a total immersion into self. Often when you compose mood boards at home or online you tend to hold back for some reason whereas a book that you can store can be less about sharing with others and more about sharing with yourself, personal growth, learning and saving to look back on for years to come. You can include themes that may be too embarrassing to share publicly or explore topics that you may feel are too private to pass around within your online social network. It's a very nice way to bookmark your life visually and I love it. 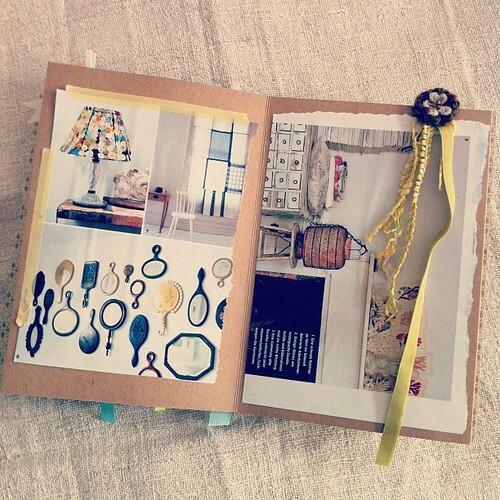 What do you think of this idea to collect visual notes into small books at home? Do you do make these too? If so, post them on your blog and share the link below if you'd like so we can see them!